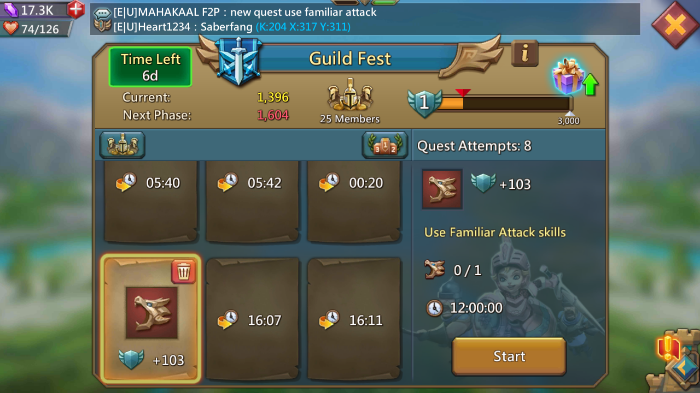 Guild Fest is one of the best monthly events in Lords Mobile that needs teamwork. The rewards will depend on how much points the whole guild makes. To help players reach their target tier of rewards, they rely on guides available online. And for a very long time, those guides worked their magic. 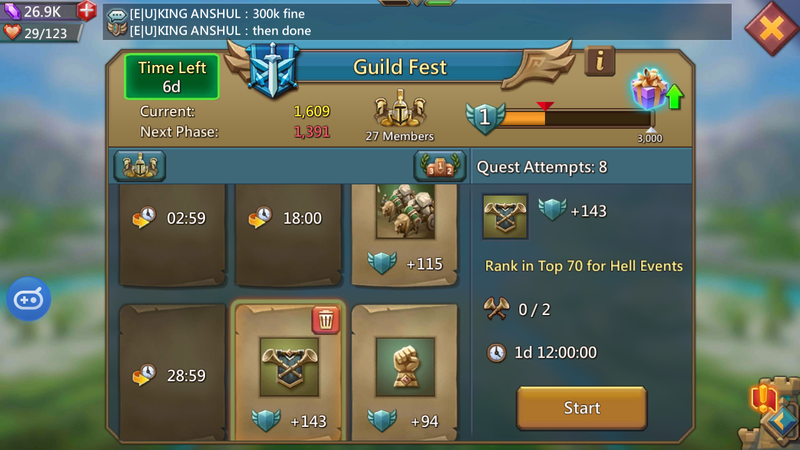 However, this March 2018, just after Chinese New Year, IGG launched new high-point quests for Guild Fest. Taking a quest without a guide or prior experience means a chance of not being able to finish it. Any competitive guild that wouldn't want a chance in failing would simply ignore and delete those quests; therefore, denying their chance of getting better rewards since these new quests indeed give very high points. Majority of these new quests concerns Skirmish 8 buildings (Familiars, Merging Pacts, Labyrinth, etc.). There are others about clearing a tile, ranking in solo or hell, and get essence, too. This task is much more difficult than Complete Phase 3 Hell Event quest because there is no way of knowing your rank until the event ends. All players in all kingdoms taking the Hell Event will be ranked according to points. So if you really want to take this quest, make sure your points is way more than what is required. This is an even more hellish quest than Rank Top 70 in Hell Event. Solo events are easier to finish because of low points and longer deadline. This means more players are competing for the top rank and, hence, less probability of you getting into Top 70. There are solo events though that is easy to get a ranking at though: those that do not require building and research points. Hunt monsters, labyrinth, train soldiers, and merge pacts solo events that do not come with building and research are easiest to get top 70 at. The reason behind this is very few people take these kinds of solo and hell events. The technique to get into top 70 in Solo Event that require building points is to make points that only leaves a little to finish 3rd phase. And then for the remaining points, construct a building that gives a very high might to finish 3rd phase. Research is the hardest to get a ranking at. If solo requires research points, do away with it. This is a quest for lucky players only. It doesn't matter whether you have 1k or 10k holy stars. The labyrinth guardian will only appear whenever it wants to. If you are to take this quest, make sure you have a lot of gems, too, so you can buy additional holy stars whenever needed. There is no cheating this quest. Labyrinth guardian waiting to be hit before taking the quest won't work. This is an easy task if you have prepared for it. You will need a lot of merging speed ups and tons of resources including anima because merging pacts is very expensive. For faster merging, wear your Voodoo Shaman set gear and activate Merging Speed Boost. The best time to start merging is when you see Merging Pacts in Solo and/or Hell to get additional rewards. This is another quest that needs preparation. Some familiars need to reach elder stage first and merge skillstones in order to activate their special skills. Skillstones are also unique to each familiars. And some familiars require special items and resources in order to merge skillstones. Unless you have the right type and amount of skillstones, resources, and special items, do not take this quest. This quest is only easy if you have saved up enough fragments for the quest. Remember, though, that required fragments to upgrade skill or familiar level increases and refreshes daily; hence, it is advised that you don't utilize all required fragments in one day. If you do not have enough speed up merging, then do away with this quest. If you take it though, it is recommended that you take it along with solo or hell event to get more rewards. This is a very easy task. All you need to have is a familiar with an active attack skill and extra gems to use its skills. Only a few players can finish this quest because essence 19 can only be found in Darknest Level 5. Unless others haven't tried taking down darknest level 5 yet, do not take it. This task is only advisable if there are not much tile-hitters in the kingdom because you have to clear a tile in one deployment. So if you don't have enough troops to clear level 5 tile, then don't take this quest. Make sure to change to gathering talent and gear set before taking the quest. Those are the new quests for Guild Fest. If in case I fail to mention any new quest, feel free to comment. I wish you good luck this coming Fest!